The Ideal Homes Show that takes place in the RDS, Dublin during the October Bank Holiday weekend. As a previous exhibitor/participant of this show, having taken part in the competition for “Designer of the Year 2007″, I know that the interior designers who are taking part in the show are so busy. The ordinary person who pays at the door and walks through the show can in no way have any idea of the amount of time, effort and hard work that goes into putting together your roomset. As an exhibitor you still have to carry out your normal day to day duty, when I was preparing for the exhibition I was in full time employment working as the site clerk on the M50 in the run up to the barrier free tolling, for Jons Civil Engineering Company, who were just great. This was along with carrying out my mammy duties and the paperwork for Pedreschi Electrical & Alarms Ltd and updating my website www.tradefinderdirect.ie (which is currently being revamped). It is difficult to put together an entry to such a competition without the support of employer, family and friends. The whole experience was wonderful, looking back now there were a number of early starts and some late nights, the show runs for the complete bank holiday weekend and the days are very long. Plus the week before is spent putting the display together, painting, laying the carpet, assembling the furniture etc etc. I had a number of sponsors which I would really like to thank, (I hope I don’t leave anyone out) Lorna at Garrendenny Lane Interiors, who supplied the furniture and soft furnishings, Wendy Shaw at Colortrend in Celbridge who supplied the paint, National Lighting Showrooms, Erne Street who supplied the light fittings, Tanya at Des Kelly Interiors in Leixlip who supplied the carpet. Maureen Garry of Garry Print, who printed the flyers and business cards. Finally Daniel who took time off to help moving equipment and laying the carpet, and dismantling when the show finished. The other exhibitors who also took part were great in minding the stand for each other to allow for breaks and lunch/dinner breaks etc. The organisers staff at SDL Exhibitions who put up with all the questions and queries. Thanks also to all my friends and family who came along to see what all the fuss was about! 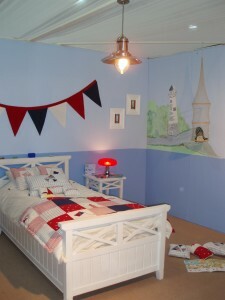 This is a photo of the roomset which was styled as a “Childs Nautical Bedroom”, it featured a mural of a lighthouse, the furniture was white painted timber which Lorna sourced in France, the soft furnishings were specially commissioned for the show, all the accessories were either supplied by Garrendenny Lane or which I sourced personally from France.